This easy craft foam turkey can make either a cute turkey pin or a name tag for place setting at the Thanksgiving dinner table. 1. First paint your popsicle sticks or craft sticks in the desired colors, then set aside to dry. 2. Print out the turkey pattern and cut out the separate pieces. Trace each piece onto the appropriate color of craft foam and cut out. 3. Glue the popsicle sticks together, overlapping just the ends and fanning the sticks out to form the turkey tail shape. 4. Write a name on the white craft foam name tag piece. 5. Glue your turkey together as shown in the photo, placing the eyes close together for the best effect. 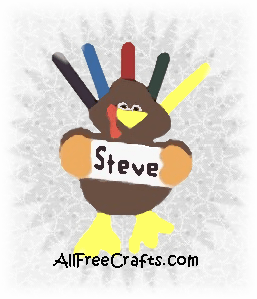 Make one turkey name tag for each person that will be at the dinner table on Thanksgiving Day!